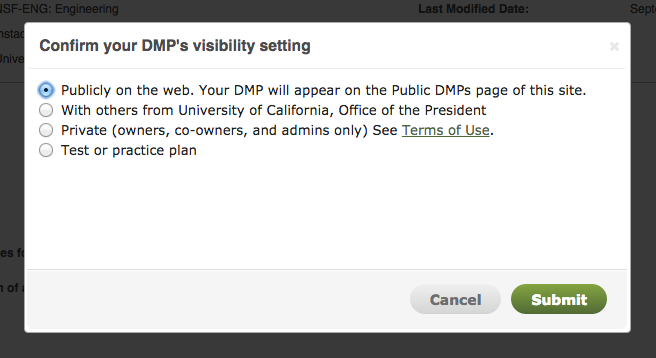 We just released a batch of subtle changes designed to boost community insight into DMP behaviors. With DMPTool usage continuing to grow in leaps and bounds, we’re well embedded in burgeoning initiatives to build RDM programs, promote open scholarship, and reimagine DMPs as dynamic, updatable inventories of research activities. The tweaks and enhancements outlined below are about determining what we should be measuring and using this information to contribute to our collective data management efforts. But before we get into the technical details, here’s a snapshot of DMPTool usage to date (a full report is next on the agenda). Our U.S.-centric user community is comparable in shape and size to that of DMPonline for the UK (plus Europe, Canada, and Australia), which reinforces our combined position as international DMP players. Plan visibility settings. We made some related changes to revise language within the tool about plan visibility settings (screenshots below). Note that plans are no longer “private” by default. We’re now asking users to choose a visibility setting at the beginning of the plan creation process. In addition, they’ll be asked to confirm their choice at the end. This should reveal preferences about sharing plans, and *hopefully* we can encourage more users to open their plans up to “public” or “institutional” audiences. The Quick Start Guide and other portions of the Help menu have also been updated to reflect these changes. Test plans. We added a “test or practice” option for plan visibility (screenshots below). 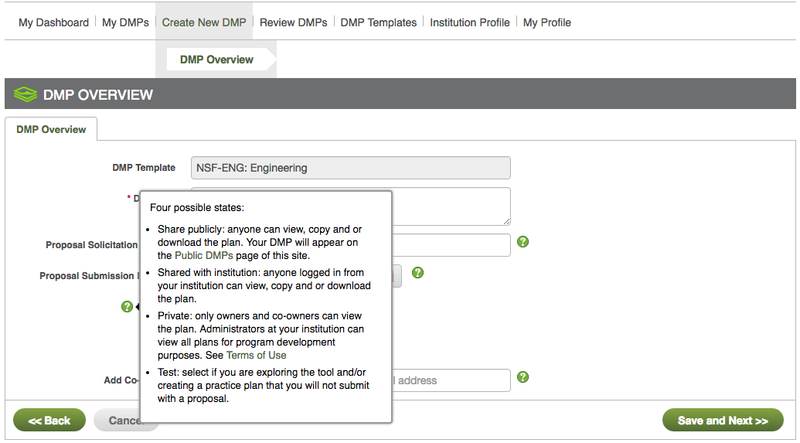 This will enable us (and institutional partners) to filter test plans from usage statistics in addition to helping us curate the Public DMPs list. Get a list of plans. We updated two API calls so authorized admins can retrieve information about ALL plans created by users from their institution (get a list of plans, and get a list of plans with all related attributes). Please note that admins will only be able to see private plans created after we implemented these changes. Admins can still get aggregated, anonymized usage info about total plans, templates used, etc. for all plans created at your institution since the beginning of DMPTool time (see the GitHub wiki for a complete list of API calls). As always, we’re eager to know what you think. Please send us your questions, comments, use cases for machine-actionable DMPs, etc!